Hank the Cowdog. Have y'all heard of him? Why, he's the most popular West Texas cowdog among the homeschooling community. I'll fess up. I had heard of Hank, even had a few titles hangin' out on my shelves, but I had not read a one. Not a one, I say! Great guns, was I missin' out! The Hank the Cowdog series by John Erickson has been around for years. Erickson, while working full-time as a cowboy, farmhand and ranch manager, began to publish short stories in 1967. In the early 80's, Erickson started his self-publishing company, Maverick, and the Hank series took off immediately. The popular audio recordings, performed by Erickson, soon followed and became the longest running successful children's series on audio ever. What a fun package we received for review from Maverick books! 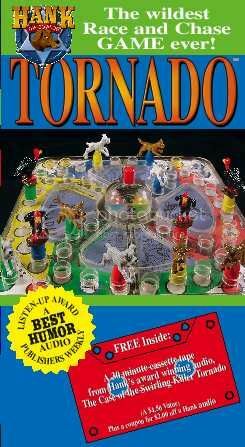 Included were a book titled The Case of the One-Eyed Killer Stud Horse, A Tales and Tunes from Hank the Cowdog CD, and the Tornado game. 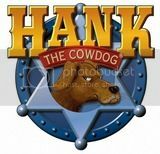 Each story is told from the perspective of Hank, a mischievous, smelly, cowdog who is takes very seriously his job of Head of Ranch Security. Drover, Hank's sidekick, is a loyal "little white mutt" who looks up to his pal Hank. Hank is quick to fill in his buddy Drover with his infinite wisdom on daily happenings at the ranch and life, like when he informed Drover he was just being a "hypocardiac" about his conveniently bum leg in this title. The books are really quite hilarious. The Texas slang and colloquialisms, especially from the perspective of a cowdog, make for an enjoyable read. My son, who isn't much of a reader, finished this title in no time. I actually was able to squeeze a book report out of him as well, though he despises writing. 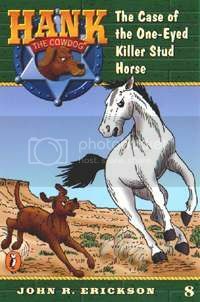 While it was certainly not a thorough report of the whole story, it was rather telling of the boy appeal these books have with talk of Hank being whacked on the nose with a spoon, Hank eating bacon grease and throwing up in Sally May's shoe, and Sally May scaring off the One-Eyed Killer Stud Horse with a shot gun. After finishing this title, he actually requested some more to read. Hank equally appeals to girls, and my daughter fondly remembered reading Hank from years ago when she saw the review package and snuck a read of the new title. These books have a rough and tumble sense of humor. This is a cowdog, afterall, not some sophisticated show poodle. For many, Hank's tendency to be uncouth in ways that only a cowdog could is what makes for great belly laughs. For those more sensitive to such humor, a pre-read may be in order. Hank's character doesn't hesitate to call another beast of the ranch a moron, but all-in-all one can tell he's just trying to earnestly be Man's Best Friend and protect the ranch. Hank usually suffers the consequences of his poor actions and feels remorse, giving some moral stories interwoven into all of Hank's mischief. The Tales and Tunes CD is a collection of songs and story excerpts. Erickson portrays each character with a unique voice and I have to say he does a fabulous job. After hear Erickson's voice in character, the books are all the more enjoyable. There are 9 songs included on this CD, including two that came from the title sent in our package. However, I vote "It's Not Smart to Show Your Hiney to a Bear" the most humorous title on this CD. Lastly, we were sent the Tornado game, described as the "wildest race and chase game ever!" This game plays very similarly to Trouble. There are four colors with three characters: Hank, Drover and Junior Buzzard. 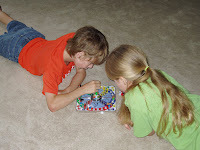 Players take turns spinning the center spinner and moving their characters around the board and then safe to home. Players can get sent back to home if another player lands on them and then have to wait again for the appropriate number to come up in a spin before moving their player out to the board. The game comes with a 30-minute cassette tape with excerpts from The Case of the Swirling Killer Tornado. I like that the game folds in half and the pieces can be stored inside, making it a convenient game to take on travels. Sure'nuff, Hank was good for a giggle or two in our house before we started some more studious readin' this school year. Book titles retail for $4.24 (paperback) to $12.49 (hardcover). The Tales and Tunes CD is a very reasonable $3 and the Tornado game is $12.99. Maverick has a host of other products available at their website, including audio books, plush toys, t-shirts and playing cards. Kids can also join Hank's Security Force, explore the ranch, learn about the characters and leave Hank a message. To read more reviews on this product, visit the official TOS Crew blog. Disclaimer: This review was provided as a result in my participation in The Old Schoolhouse Magazine Crew, a team of 100+ homeschooling parents. While the product was provided at no expense to me in order to provide this review, I have not received any other compensation. Furthermore, receipt of the product does not guarantee a positive review. I strive to give a balanced overview of each product, detailing my opinion of both pros and cons of how the product works for my family. What works for one family may not work for another. I encourage you to read reviews of other Crew members and research sufficiently to determine if any product will be a benefit to your homeschool. Most kids today are pretty tech savvy. If they aren't, they certainly want to be. Unlike their parents, they've been immersed in the digital age of communication of clicking, Googling, emailing, and instant messaging. It is no wonder that kids who receive communication via the computer screen will want to send information that way as well. And what better way for kids to do this than create their own little piece of the web with their own website? Brian Richardson, a middle school computer literacy teacher. By the end of the DVD, students and adults will have the knowledge to create a basic website, including scrolling text, colored backgrounds and pictures. No special software is needed; only Notepad and Internet Explorer, included with every Windows-based computer, are required. 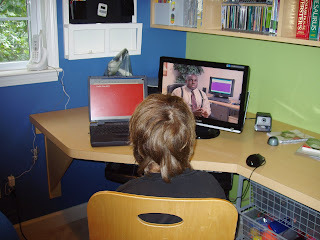 The DVD presentation is intended for viewers to build a website as they watch, along with the two children on the DVD, while Mr. Richardson carefully explains each step with built-in review. If you have a laptop available, this is ideal. My son started watching the DVD on a TV screen but found that he had trouble reading the text on the screen. Playing the DVD on the desktop computer while using the laptop to build the page worked much better. A portable DVD player next to the computer would have the same results. My son would pause and start the DVD as needed while completing the steps. Working along with the DVD kept him engaged and gave the instant gratification of each step that all boys love. For most steps, Internet access is not needed. Finding background patterns, rather than solid colors, and pictures that aren't already located on your hard drive are the exceptions. Since our laptop doesn't have Internet access, I just had my son complete and save his basic website and we copied it to another computer when he had finished the lessons. At that point it was easy enough to add pictures and different backgrounds to his design. I'll have to admit that my knowledge in the area is limited – very limited. It isn't because there is a lack of information, but quite the opposite. There is too much information. I've found very few products that have scaled the information back enough to be successfully used by a child (or curious adults!) just starting out. Not only are those thick html books intimidating to most, some just learn better visually and with an instructor. The hand-holding approach of Web Design for Kids (...and Curious Grown-ups!) is simple enough for even young elementary children to follow. The technical terms and steps are explained in a language that anyone can understand. Brian Richardson originally targeted this DVD for ages 10-adult, but after seeing younger kids use it and speaking to parents, has since lowered the bracket to age 8. Kids that already have some html knowledge or who need a lot of bells and whistles in presentation may not have as much appreciation for this program. Flashing graphics, exciting sound effects, and snazzy dialogue are absent from this DVD. However, for my son, this was a positive. We actually own a DVD explaining html from a popular series that my son previously attempted to use as a learning tool. All the pizazz of the program was too distracting for him to learn. As a hands-on resource for learning basic html and to pique interest in website design for those just starting out, Web Design for Kids (...and Curious Grown-ups!) is effective. My son's only complaint about Web Design for Kids (and Curious Grown-ups!) was that the children on the DVD sounded a bit scripted. While I don't disagree, it did not take away from the instruction. In addition, the kids in the DVD ask a lot of questions that may come up while your child is building their web page. Below is a segment of the DVD, which is representative of the style of each lesson. Overall, the program was a good experience and a great way to make web design, a topic that often befuddles adults, less intimidating to kids. I was pleased that it helped with typing and writing skills, in addition to helping my son create his own little piece of the web. To see his creation, click here. Most everything needed to create this website was taught on the DVD. He is already talking about creating another website on a different topic. Note: The DVD does not provide instructions on how to publish your website, but it will be available on an upcoming continuation of Web Design for Kids (and Curious Grown-ups!). In addition, the DVD does not show how to make links (as on the bottom of my son's page), but that was required in order to use the background my son selected. This, too, will be taught in the next DVD. The retail price for Web Design for Kids (and Curious Grown-ups!) is $39.99. However, Click-Drag Solutions is currently offering a summer special price of $19.95 (plus $3.99 shipping and handling). Furthermore, Click-Drag donates a part of its proceeds to five different charities as a way to give back to the community. It is refreshing to see a small business giving back, especially at a time when many charitable organizations have seen a drop on donations. Visit the website to see a list of recipients or to purchase your copy of Web Design for Kids (and Curious Adults!). For years I've used a combination of AWANA programs, Sunday school, summer VBS and camps and reading Bible stories aloud as our Bible study. As a result, my children are familiar with most Bible stories, can recite various verses and more importantly, truly understand and accept what Christ did for each of us on the cross. Now that I have an approaching teen who has outgrown AWANA and other programs, I've been looking for materials for her to truly start studying the Bible and to dig deeper. My list of criteria is something self-directed, without busywork, not overwhelming, but with appropriate depth. One of the first review opportunities I had this year was for an unfamiliar company, Grapevine Studies. Grapevine Studies provides easy-to-teach Bible curriculum for ages 5-adult, available in softcover and e-product formats. I was intrigued with their concept of “stick figuring through the Bible”. The idea is to give children a better overview of the Bible while presenting it pictorially in a way for better understanding, engaging both intellect and imagination. My daughter requested the Level 5 Old Testament Overview by Dianna Wiebe to review. She reasoned, “I might as well start at the beginning!” This particular level does not present the "stick figuring" method as in the lower levels, though there is opportunity to be creative. Consisting of one workbook, it is meant to be a self-directed study and overview of the Old Testament. Aside from the purchased workbook, students also need a Bible, a 3-Ring Notebook, a Bible concordance, a Bible dictionary, and topical Bible and a Bible atlas. The workbook, meant to be a year-long study, consists of 50 weekly lessons. The study itself is very easy to follow and each lesson is structured the same. The lessons can be used within a Sunday school/group Bible study structure, with class time being used for review and for supplemental studies or individually. There are also suggested daily assignments for homeschoolers to fit within a school schedule. Each lesson starts with a section of scripture to be read by the student. The passage is then broken down into smaller segments. For each segment, the student is to give a five-to-seven-word title and record what they have learned about the passage through writing notes, drawing pictures or a combination. At times, students will be prompted to find locations mentioned in the scripture in the atlas to provide context for the events and people being studied. After summarizing each passage, the student is to select a portion for the week's memory work. While reading the scripture passage, students are to select at least three words to look up in the Bible dictionary, the concordance and the topical Bible. The information and any resulting notes are recorded on the Study Page. “The goal of the study page is to provide you with a record of your study notes.” The Passage and Study pages are scheduled to be completed over two days. After reading and studying the lesson's passage, over the next three days the student then completes the Review Page, which is divided into three sections: Questions, Activities and Further Study. It is recommended that the Review Page be read before beginning the lesson to help the student better understand and think critically about the assigned Biblical reading for each lesson. Answers to the questions should be done on a separate paper after studying the passage and will eventually make up a companion notebook. Write a story about the Fall from the viewpoint of Adam, Eve or the serpent. Create a picture of one or more of the furnishings or coverings for the tabernacle. Map the places to which Isaiah, Jeremiah, and Ezekiel prophesied. Study the unusual animals mentioned in Job: behemoth, leviathan, warhorse, and coney. Research Hammurabi's laws, then compare and contrast them to the laws of God. Study the warfare strategies used by the Israelites to conquer Canaan. The Old Testament Overview suited our needs fairly well. My daughter liked that she could work independently. The lessons are straight-forward and the pages uncluttered. I liked that the first lesson required the student to process through what they already knew through a timeline of each person, place and event covered in the study. Familiarity is not the same as knowing details! At the end the study, students are to complete this same task as a reflection of what they've learned in the study. Students will also record such information as generations covenants, and promises fulfilled in the Old Testament. While this study is meant to be an overview, I felt the accompanying activities and exercises provide opportunity to add more depth to the study, especially for younger teens. As an adult, I appreciated the Further Study section more than the Activities. Many of the Activities would be well-suited for homeschool projects or could be integrated into other subjects, e.g. creative writing and art. While the Level 5 program does not include the trademark "stick figuring" found in the earlier levels, it does provide plenty of drawing opportunity in the exercises. My artsy daughter seemed to prefer theses activities over the others. 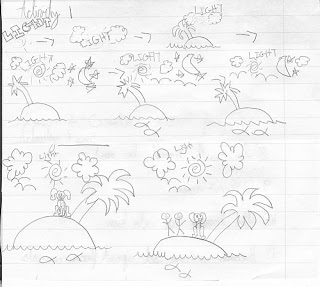 Below is a drawing created for the activity selection of, "Draw a picture or series of pictures representing the order of Creation." Coincidentally, there are stick figures in this drawing! While some of the Level 5 books do have teacher notes, this particular study does not. I personally would have liked to see discussion points and suggested answers for the questions in the Review Page. Some of the questions were subjective or meant to be thought provoking, but others were more objective and had main points to them. A reference in the back of the book for students to check answers or explore those they hadn't considered would be a nice addition to the study. I generally don't prefer electronic products, which is why I went with the softcover. However, the format of this product is very compatible in an e-book form. The layout is clean, without graphics. It would be very easy and inexpensive to print out a weekly lesson. The added benefit is the ability to print out multiple copies for students in your immediate family. I suspect that when my daughter is done with this study, we will be purchasing the Level 5 New Testament Overview. Grapevine's use of chronological lessons and timelines are effective in understanding the big picture and creating a solid foundation for further study. 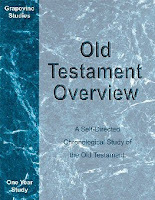 Level 5 Old Testament Overview retails for $28.95, in either softcover or as an e-book. In addition to the Old Testament Overview and New Testament Overview products, available in various levels, Grapevine Studies has a variety of other products. Among them are Biblical Feasts and Holy Days, Birth of Jesus, and Esther. Also available are various study resources and supplemental materials needed for some of the levels. For those curious about the stick figuring aspect found in the younger levels, be sure to read reviews of this product at the official TOS Crew blog as well as visiting the Grapevine Studies website. Special Discount!!! Save 30% on all Grapevine Studies books by using the code "crew9" when you place your order. Expires September 30, 2009. The thought of my kids winning any race based around math is, frankly, absurd. While they know the concepts, quick skill is not a strength by any means. They move about as fast as frozen molasses dripping out of an eyedropper. My son is actually quite strong in math. However, his insistence on skip counting every multiplication step makes for slow work. Last year we added some mnemonic techniques as well as practice on estimation and starting with known factors. These were all helpful, but it came down to just needing some drill and kill. It sounds boring, but it needn't be, with a program like Quarter Mile Math. Quarter Mile, by Barnum Software, has been around in homeschooling circles for some time. The concept is simple, yet effective. 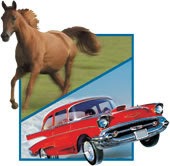 The drill and kill method is presented through short races of either cars or horses. The beauty of the program is that after five races on any given topic, the student is actually racing against their top best times. This creates steady motivation to improve their score, without the disappointment of losing to someone else. Depending on the edition purchased, there is also an option that will allow students to easily race against each other. Students can race either horses or race cars. There are a variety of topics from which to choose. To see topics categorized by level, click here. For each topic, the program keeps the top five average from previous races, creating a self-competitive environment. There are six racing lanes. The one on the left is the student with the five lanes on the right being exact replays of the five best races of that student. Once the race starts, problems appear at the bottom of the screen. The student is given three tries for each problem before being given the answer, which they then have the enter. Those that were answered incorrectly seem to reappear at a higher frequency until they are mastered. At first, my son wasn't thrilled with practicing his math facts. Sure enough, his first race was met with groans and cries of frustration because he had many incorrect problems and “lost” the race, even though the program is actually designed such that students place first for the initial race. Once he had raced at least five times, I was quick to point out that he was racing against himself. Therefore, he won every race! For each race, he'd strive to be first place, constantly improving his own score. Each day I have him work only for about 15 minutes, first on a particular table, then with random problems of all the tables he's practiced so far. His confidence is increasing and he's no long skip counting every singe problem. Success! For review, I received the Deluxe Edition, Bundle 1, 2, and 3. This is a subscription edition that costs $2.95 a month, includes topics from all levels, K-12, and can accommodate 12 students. Once installed, you do not need the cd-rom to run the program, allowing installation on multiple computers in your home for simultaneous practice. You do, however, need to have an internet connection to use this edition to connect to one of Barnum's servers. Students do not need to go on the internet to play, nor does it open your browser. From the user perspective, it operates as a game that is not connected to the outside world. You can start and stop your subscription at any time if subscribing by month, or purchase a longer subscription at a reduced rate. If your student needs practice for only a short time, this is more economical than purchasing the standard edition. The monthly rate would be an excellent option for summer practice and reinforcement of skills learned throughout the school year. All levels are included in the subscription price. If you have a student that progresses very fast, higher levels are available without having to buy another level. Furthermore, if you have many children with a wide range of abilities, they can all use the same program at no additional cost. The tracking features are more sophisticated than the standard edition. Where the standard edition only keeps the top five scores, the deluxe gives dates, number of races, topics, scores and tracks progress for each user. If desired, the tracking results can be printed for records. If you have children close in ability, they can race against each other for a bit of extra competition. The license even allows you to send the software to out-of-state grandparents so they can race against your students. What a great way to get extended family involved in your child's education! Students can use the program at the same time if you have it installed on more than one computer in your home. You must have internet connection to use this edition, preferably high-speed service. The Deluxe Edition is a subscription service. If you plan to use it very sporadically or just prefer access as long as you own the product, the standard version may be a better investment. This edition comes on a CD-Rom, used to install and run the software. There are three levels that can be purchased individually or bundled with other levels. Each disc has leveled topics, though the game itself operates the same as other editions. Students cannot directly race against siblings with this edition, only their own top scores. Only the top five average is saved by the program. You pay a flat fee and have access to the program as long as you own the disc, allowing you to put it away until a younger child is ready to use it. It may be more economical for long term practice at the same level. Students can not simultaneously use the program. Students cannot race against each other directly. They can, however, compare scores based on the top five averages of a given topic to see who is ranked higher. The tracking system is not as sophisticated as the Deluxe. Only the top five scores are kept. You will need to buy multiple levels if you have a wide range of abilities among your students, perhaps making it more costly depending on the duration you plan to use the program. A full comparison chart can be viewed on the Barnum site. I've used the standard in the past and the deluxe for this review. Which is the best to purchase will depend on your family's particular needs. Barnum Software is looking for groups of seven or more families who would like to participate in a pilot tournament program. Families in the group would use a special Deluxe version of The Quarter Mile Math that would enable students within the group to have tournaments with each other. This is a great option for homeschool groups. Please contact Christopher Wright at cwright@thequartermile.com if you are interested in participating and for more information. A 2-minute introduction video is available on the Barnum Software website in addition to 6 more in-depth videos. Be sure to check them out if this product sounds like a great addition to your homeschool. Throw away those boring flash cards! For improving computational speed, this software really can't be beat. To see how this product worked in other homes, read more reviews on the official TOS Crew blog. *Until Sept 30th, all of my readers are being extended a $5 discount off any product, Standard or Deluxe. Just use code 7W7A7 on your order form to receive your discount! More and more companies are going digital. It reduces cost and some like the instant accessibility to the product. I've noticed that a new trend among vendors is to have security software as part of the download package. I'll admit that this sometimes irritates me because it may make the download a bit more difficult or restrict my own personal use in some way. For example, one product I've reviewed recently only allows you to print the product twice, even it you just print one page. For those who print of pages as needed, this is a hassle to work around. Often times you can't put the file with security features on to a memory stick to print at the local office supply store. I've heard users get offended at security software and feel as if they are being treated as criminals. However, I understand this new trend is fueled by a general lack of respect for copyright laws. The ease of passing along a digital product does not make doing so morally correct. Unfortunately, it seems the passing along of copyrighted digital products isn't all that uncommon. I think some of it may simply be a lack of understanding that the material is copyrighted and that even if you delete the file from your system, passing along the file to someone else is illegal. April, a member of the the TOS Crew, and Heidi Strawser, our wonderful Captain, have addressed this issue a bit more in-depth as well as listed some free resources for you. You can read more over at April's blog, ECloud Homeschool. There are a set number of responses given when people find out that our family homeschools. The disgusted, "Why would you do that?" The sometimes insecure but often self-justifying, "I could never do that!" The you've-got-to-be crazy, "Homeschool? I can hardly wait for the first day of school each year!" The encouraging, "Good for you! I wish I had done that with my kids." And the infamous and all too familiar, "What about socialization?" "I would love to homeschool but my husband doesn't support it." These are the moms that have homeschooling on their hearts, while sending their children on the yellow school bus each morning. Some of them have even researched curriculum, checked out local support groups, and carefully broached the subject with their husband, who, because of various reasons, is not in support of the decision. In my own personal experience, I was the one that needed the convincing. It didn't take long, just a planting of the idea along with the encouragement of my husband. While I was grappling with my own commitment to homeschool, a friend of mine was trying to convince her husband to home educate rather than send their son to the local public school. I watched my friend go through the trials of emotional conflict for several months, somewhat guiltily knowing I already had the support of my husband, while she tried to convince her very analytical husband that this was the best option for their family. Finally, my friend, a writer, had a epiphany. She combined her completed research, writing skills and her heart into a well thought-out written presentation for her engineering husband. Essentially, it was a business plan for their homeschool. It worked! Shortly after her presentation, her husband was fully committed to start their homeschool journey. The written document was coined the “Homeschool Brochure”. Over the years, as co-leaders for a homeschool support group, this document has been passed along to numerous moms who have a heart to homeschool but lack the support of their husband. It was requested so much that friends proclaimed it would make an excellent book. I'm happy to say that the original “Homeschool Brochure” is now available as part of a new e-book, Convince Your Husband to Homeschool: A Five Step Strategy. In this ebook, Kathryn Tyler will walk you through the steps of creating your own “Homeschool Brochure” to present to your husband. She shows you what areas to research, how to answer your husband's doubts, resources to seek out and a practical format to create a plan specific to your family and your husband. Also included is Kathryn's original presentation that was so successful in her own home. This e-book is more than a how-to manual, but a collection of personal thoughts and perspectives, through excerpts straight from Kathryn's journal to quotations from other homeschooling moms. This thoughtful and straightforward guide will help you take what is on your heart and transform it in a way that your husband can understand. Convince Your Husband to Homeschool: A Five Step Strategy is available for purchase at Pear Educational Products for $14.95 as a quick download. However, I have a FREE copy direct from the author for one lucky winner! Is it on your heart to homeschool? Or maybe you already homeschool but without the full support of your spouse. If not for yourself, perhaps you have a friend who desires to homeschool and is dreading the upcoming boarding of the bus on the first day of school? Enter for yourself or someone else! If you enter for someone else, just provide me with the direct email of the person you'd like to receive the e-book. This giveaway will end on August 26th at 6 pm EST. Winner will be selected by random drawing. The Old Schoolhouse Magazine is very excited to share the latest TOS E-Book (about E-Books!) with you . . . Many of you are already familiar with the value of E-Books but there are plenty of homeschoolers who aren’t, and many that would welcome additional information. And right now this $14.95 value is FREE! Why should I buy E-Books and what are their unique benefits? How can I use E-Books with homeschooling? How am I supposed to read them? Can I get help creating my virtual bookshelf? What can you tell me about storing E-Books on my computer? What are some great organizing tips for E-Books? Can you give me a lot of suggestions and ideas that I can actually use? What can I learn about the E-Book market and The Old Schoolhouse®? What do I need to know to publish my own E-Books? What are some of the legal issues in electronic publishing that I need to know about? Whether you’ve wondered about E-Books, or are already addicted to them as an incredible resource, or would like more information to even write and publish your own E-Book, you’ll be delighted by the wealth of information provided. Get your free download today here! Between the ages of six and eight, my daughter, now 12, took machine sewing classes. I purchased a sewing machine for her to use and she made quite a few simple projects during that time. The classes were enjoyed while they lasted, but the sewing teacher ended up getting a full-time job and there wasn't another teacher readily available to inspire. Since then, the sewing machine remains unused with the exception of an annual unveiling, by me, the non-sewer, to make costumes for a yearly theater production. I completely wing the costumes and have never used a pattern. Let's just say it's a good thing the performance is done on an elevated stage at a distance. Otherwise, my lack of skill surely would be noticeable! Sense and Sensibility Patterns was started in 1996, introducing old-fashioned designs to a niche' market. Combining this cottage industry with the internet, accessibility quickly grew the company with the demand of those seeking feminine clothing. Sense and Sensibility now offers 18 patterns from five different eras, as well as online classes and eclasses. Patterns are available as a download or printed. 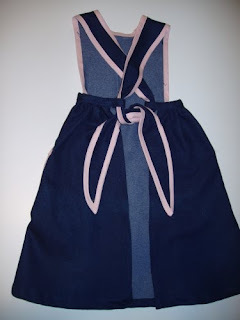 When I had the opportunity to try a Sense and Sensibility e-pattern and e-class bundle for the adorable Edwardian Girls' Apron, I considered it a great opportunity dig out the sewing machine. As a non-sewer, I would be an excellent candidate to give this product a trial run for those that would like to dabble in the craft. I was further motivated by some fabric that had been packed away for several years and visions of my 3-year-old niece twirling in the apron. My daughter liked the idea of making her cousin an early Christmas gift, so we dusted off the sewing machine and got started. I was curious about how an e-pattern and e-class for sewing would work. Several files were downloaded from the site. Included were the actual pattern, an audio file, a PDF file, some instructions, and a file that showed the layout of the pattern. After reading the pattern instructions and making sure my printer was set correctly, I printed out the 25-page pattern, with a range of sizes from 2-14. The pages are printed in order of placement for a grid layout. I added the page number to the back of each page as it printed to avoid confusion on the order. The next step was to piece and tape together the pages to get a complete pattern. I didn't find the piecing together difficult, but it did take some patience. Holding the sheets of a paper up to a window to make sure I was lining up properly made the process less difficult. Before long, I had my pattern and fabric pieces cut. The class portion consisted of a PDF slide presentation paired with an audio file. Jennie, who created the pattern and teaches the class, explains each step very thoroughly and includes links to supplemental video for some of the more trickier steps. Much of the first part of the class is devoted to explaining how to make your own binding. I decided to purchase binding and save myself some time (and frustration). I skimmed the class and then took my laptop and set it next to the sewing machine. I liked that I could listen to each portion, stop or repeat portions of the class, and work on that step. It really is like Jennie is right there in the room with you. My daughter helped quite a bit and regained her sewing confidence as we moved along. I'd sew one pocket, she'd sew the other, and so on. There were some tricky parts for a beginner, but I was able to get through each step by reading the instructions and watching the class. Having never sewn with a pattern before, I was pleased with the results! I especially like the criss-cross strap design that threads through loops on either side of the skirt. This design allows adjustment of the straps as the child grows. The denim is durable and suits my niece's personality, but any patterned or floral fabric would give it a more feminine look. I hope my niece enjoys her new denim apron on Christmas morning. My daughter plans to scale down the pattern, easily done by reducing the PDF file, to make a matching apron for my niece's doll. We'll include some cooking utensils for a personalized Christmas gift from the heart. Overall, this was a fun project to do with my daughter and gave me some confidence to perhaps try a simple pattern again. Younger children could help by tracing the pattern to the fabric, stitching some of the straight seams, and ironing under assistance. Older children with some previous sewing experience could work fairly independently. I found the downloads convenient, the class helpful and the customer service exceptional. Sense and Sensibility offers many other patterns, including a matching Edwardian apron for mom. The e-pattern and e-class bundle costs $24.95. The pattern is available separately as a printed pattern for $12.95 or an epattern for $7.95. 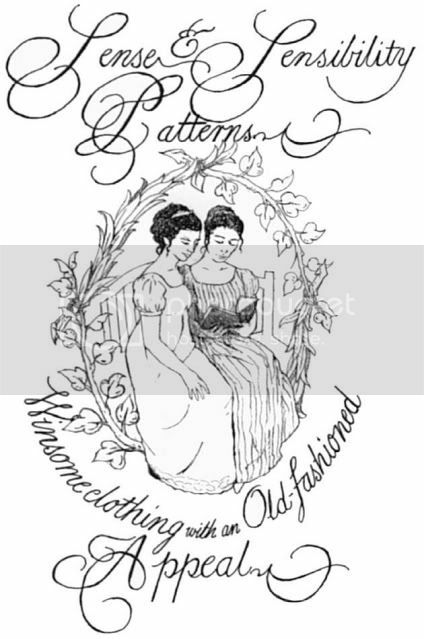 Visit the website to see some of the other historical patterns available, get sewing tips and read about the Young Designers' Pattern Contest. 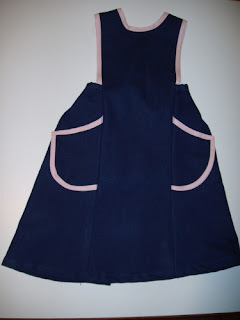 Be sure to check out the other reviews and pictures of completed aprons by visiting the official TOS Crew blog. Perhaps you, too, will be inspired to dust off that sewing machine to make a treasured apron for your own child or a thoughtful gift for another little girl in your life. I had great intentions of lots of blog posts and some sprucing up around here. I can't say I exactly accomplished my goal, with just a couple of posts and adding categories to my sidebar. Now that fall is upon us, things will be picking up very soon. These are just the products that I am currently reviewing. There are much more in store for this year. To look at this year's line-up, visit the official TOS Homeschool Crew blog. I'll also continue to share all the "chatter and clatter" going on in our household, now that the lazy day of summer are coming to an end, as well as a homeschool informational series. For now, I think I'll enjoy a few peaceful hours while the kids are at VBS this week. I better take advantage of it now, because our schedule starts full force on August 24th.